The Kauffman Center for the Performing Arts is passionate about providing youth in our community opportunities to experience high quality performing arts. The Open Doors Transportation Fund helps schools offer these experiences to their students by eliminating or defraying the costs of bus transportation. The process for receiving an Open Doors Transportation Allowance is easy. Complete the online form and receive confirmation of your approval. Book your seats with the arts organization for a qualifying performance. Attend the performance at the Kauffman Center and afterward a reimbursement check will be mailed to your school. Any school in the five-county metropolitan Kansas City area transporting at least 20 students to a qualifying school matinee at the Kauffman Center can apply for a bus transportation allowance. Transportation applications must be submitted at least five business days prior to attending a school matinee at the Kauffman Center. How will applications be approved? All public schools with 40% or more of their students participating in the free and reduced lunch program (commonly called Title 1 schools) will be guaranteed to receive a 100% bus transportation allowance. All public schools with 20 – 39% of their students participating in the free and reduced lunch program will be guaranteed to receive a 50% bus transportation allowance and can request consideration for the remaining 50%. 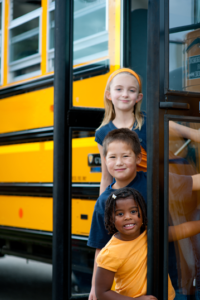 All other public schools as well as private and non-traditional schools can apply for a full or partial Open Doors bus transportation allowance. How much can my school receive? Your Open Doors transportation allowance will be determined based on the number and grades of the students attending. Elementary students in grades K – 6 will be allowed up to $3 per child for a transportation allowance and secondary students in grades 7-12 will be allowed up to $4 per student. The transportation allowance will not be available for adults attending the performance. For example, if your school purchases seats at a qualifying performance for 70 students in the 8th grade, your transportation allowance could be up to $280 or 70 students x $4 per student. Transportation costs in the metropolitan area vary – this reimbursement formula is designed to try to cover the actual costs of transporting students to the Kauffman Center. The actual transportation costs charged by your district may vary. Applications will be processed as they are received and approvals sent to the teacher within two to three weeks. Which performances at the Kauffman Center are eligible for the Open Doors Transportation Fund? Each year, there will be over twenty eligible school matinee performances, listed under the School Matinees tab on the header. Those that qualify for the Open Doors Transportation Fund are noted. Will the Open Doors Fund pay for the cost of the seats to the school matinee performance? The Open Doors Transportation Fund only applies to the cost of bus transportation for schools bringing 20 or more students to a performance. Seats for all performances must be purchased directly from the arts organization offering the school matinee. If my school is approved for a bus transportation allowance, will this also reserve seats for my students at the performance? No. You must reserve and purchase your seats for the school matinee directly from the arts organization. I am interested in getting some Open Doors Community Tickets for my group – will Open Doors Transportation Funds be available for those performances? Community Tickets and the Transportation Fund are two different parts of the Kauffman Center’s outreach to schools, children and families. Performances eligible for Community Tickets will be different than those covered by the Transportation Fund. Kauffman Center Presents student matinees are the only exceptions as the $2 discounted tickets are available to school groups who can also apply for bus transportation assistance. After you have attended the performance, the Kauffman Center for the Performing Arts will mail a check to the address indicated on your Transportation Fund Application Form.